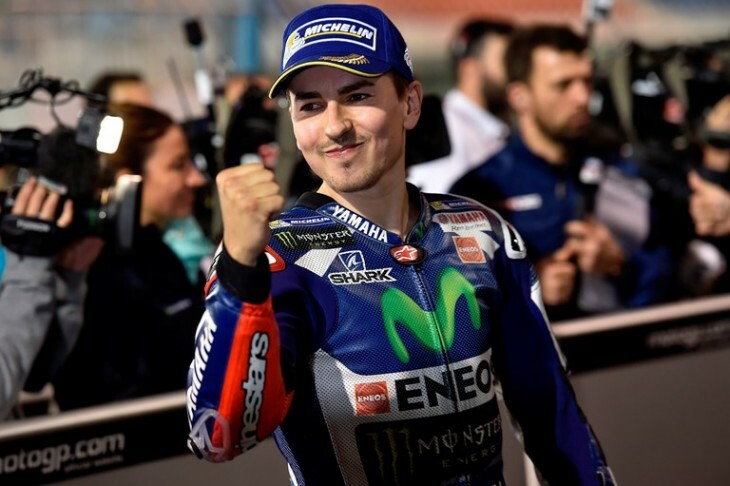 Movistar Yamaha MotoGP rider Jorge Lorenzo continued his strong form today during the Qualifying 2 session, returning to the top of the time sheets again under the floodlights of the Losail International Circuit. He secured the 62nd pole position of his career with a 1’54.543s lap, making him the new leader in the all time pole position classification. His teammate Valentino Rossi, on the other hand, left it to the last lap to make his move, securing fifth on the grid for tomorrow’s Commercial Bank Grand Prix of Qatar. Movistar Yamaha MotoGP riders Jorge Lorenzo and Valentino Rossi rode on the limit this evening during an intense 15-minute qualifying session at the Losail International Circuit to take first and fifth respectively on the grid for tomorrow’s Commercial Bank Grand Prix of Qatar. After setting the pace in FP4 with a 1’55.301s lap, Lorenzo was the last rider to start the 15-minute qualifying shoot out. As the second to last man to leave pit lane he enjoyed some clear track space. He immediately dropped under the 1’55 mark on his first hot run to take over the provisional pole from his teammate. Eager to move up the ranking order, the Doctor quickly returned to the pits and came back out on track with a little less than four and a half minutes of the session remaining. He moved up from tenth to seventh place, but knew he had more to give on his final hot lap. Squeezing out every ounce of effort on his ultimate lap, he clocked a 1’54.815s, 0.272s from pole. This time briefly put him in fourth place, before dropping one place in the qualifying standings. The Doctor will start tomorrow’s race from the middle of the second row on the grid. “I’m quite satisfied, because it’s important that we start from the top5 and we are fifth. It’s the ‘minimum target’, but it’s not so bad because we are not so far from the pole position. I lost a little bit in the second part of the lap, I didn’t do a perfect lap. If I had done so, I could have stayed a bit more in front, but anyway it’s good to start in fifth place. I’m also quite happy about the pace. We have to work and improve in the warm-up tomorrow, but I was already not so bad. It looks like four or five riders are fast and have more or less the same pace, but I’m most worried about Marquez, because today he had the best pace. Monster Yamaha Tech3 rider Pol Espargaro will commence his 2016 campaign from the third row of the grid after a determined performance today in Qatar. A thorough effort in FP3 yesterday allowed the young Spaniard to progress to QP2 where he launched into action as soon as the session began. Espargaro built up his speed before setting a personal best on his last lap that was only just over six tenths from the front row. With his confidence high in his race rhythm, the 25 year old’s sights are now firmly set on winning the battle for the leading satellite position tomorrow. Meanwhile, Bradley Smith pushed hard and produced a tireless qualifying assault today that will see him commence the Qatar Grand Prix from 11th on the grid. The 25 year old had to battle through Q1 after just missing the direct qualification to QP2 by only 0.029 yesterday, but he wasted no time and graduated straight through to the second session after setting a 1’55.490. Here, he upped his pace before firing a personal best lap which was just a tenth from his teammate. The British star now confidently awaits the 22 lap sprint tomorrow where he aims to fight for a top eight result.